If a client has more than one email, can I select which address their Client Tasks send to? Yes, you can select which email address your client tasks will be sent to. 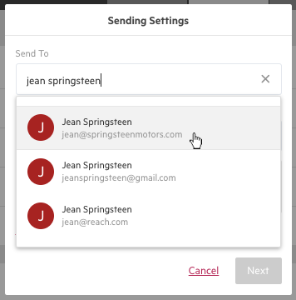 If you have a client with multiple email addresses, you can choose which address their client tasks will be sent to when setting up the client tasks. Search for the contact like normal, the pick list will include email addresses that have been saved for that client. You can choose from that list the appropriate email address, and select Next.